Stairs have become their own stars in some of these Hollywood sets. Anyone who watched Home Alone as a kid was in awe of Kevin’s genius. They’ve also wanted to sled down their house’s steps and straight out the front door into the yard. The carpet on the stairs gives him a good send off and he flies out the door. Several people have tried the stunt in real life, and it works! It can be said that these stairs are one of the most iconic images from Titanic. The ornate detail captures the essence of first class. The grand scale of the stair is heightened by having it split and rise to each side of the balcony. The carved detail on the back panel give the stair a focal point at its center. This stair is the perfect setting for women in extravagant dresses and men in dapper suits. It would be difficult to write a post about staircases made famous by film and not mention Rocky. The staircase at the end of the iconic scene shown above is actually the entrance of the Philadelphia Art Museum. While they have their own purpose, many people recognize the steps by a more casual name, the Rocky Steps. Since the movie debuted in 1976, visitors to the city of Philadelphia have run up the 72 step staircase to recreate the moment of glory. A bronze statue of the boxer made its appearance in Rocky III and now lives at the bottom of the staircase. This stair isn’t famous for those walking up and down it, but rather what’s going on under it. 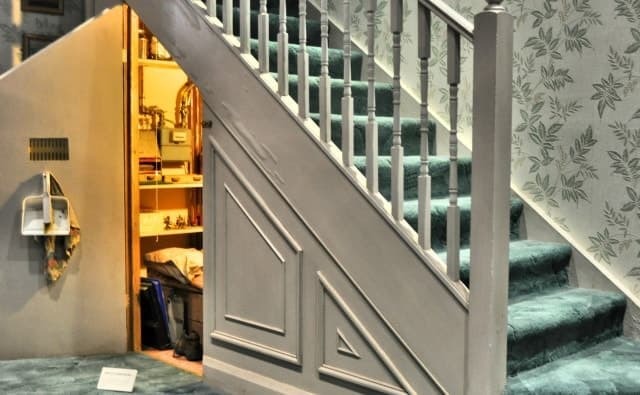 Anyone who has read or seen the Harry Potter films knows that Harry started his wizarding journey with a letter addressed to The Cupboard under the Stairs, 4 Privet Drive, Little Winging, Surrey. This very specific address points to Harry’s room in his aunt and uncle’s house under the stairs. The movie Inception is about the manipulation of dreams and how that can affect us in our everyday life. This particular dream features the Penrose Stairs, also known as the impossible staircase. This stair seems to turn into itself with no end. The right angles form the landings of the next staircase. This never ending stair in the movies shows how dreamers can manipulate architecture to contain projections. Alfred Hitchcock’s classic film Vertigo uses a spiral staircase to set off Detective John Ferguson’s fear of heights and the plot for the rest of the movie. 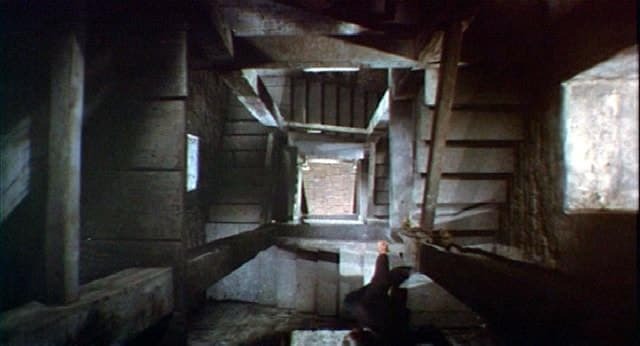 By using a shot that focuses straight down the center of a spiral staircase, Hitchcock creates a feeling of unrest and the loss of balance. This iconic shot not only represents a classic film, but also gives insight into the aptly named Vertigo shot in film. This consists of changing the center focus and zoom while leaving the surroundings untouched. While this scene looks very different from the previously mentioned Penrose Stair in Inception, they are actually the same basic idea. The film’s director, Jim Henson, was inspired by M.C. Escher’s images of never ending stairs and impossible architecture. These stairs became real on set. These stairs, just like the ones mentioned previously, are never ending and seemingly impossible to climb. 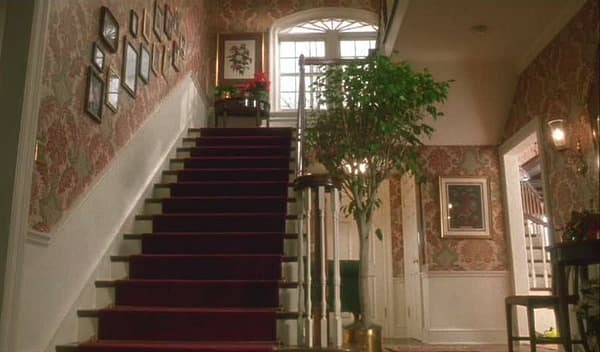 While this may be the only staircase from a television show featured in this post, it is arguably the most iconic. 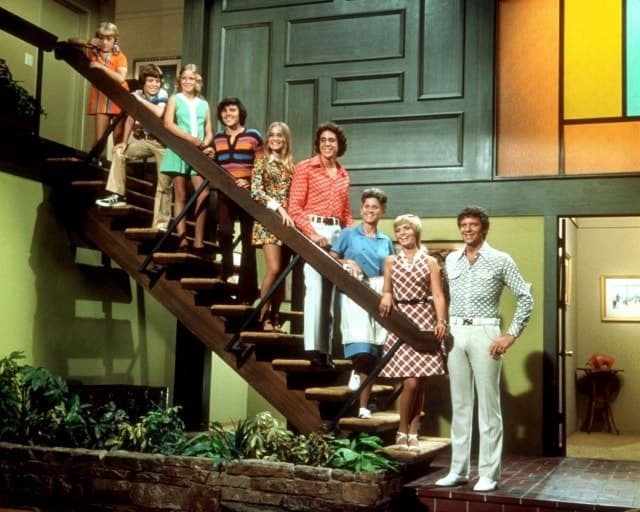 “The Brady Bunch” is defined by its large family and their classic 70’s style. The floating stair is an iconic part of their home’s architecture. This picture was taken every season as the kids got older and their styles changed.